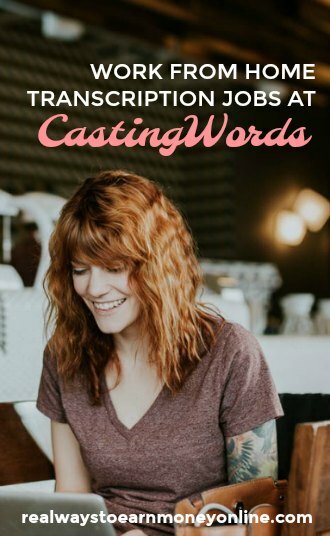 If you're new to general transcription and would like to get some paid practice in, CastingWords is a company to consider. They are a US based company that has existed since 2005. The company has a website where you can sign up directly and work. Note that one reader has let us know if you're from Rhode Island, you're not able to work for this company. If you are completely unfamiliar with general transcription, you may want to read more about how to become a transcriptionist from home. The pay varies depending on the file you're transcribing. The rates are all over the place with most paying way less than $1 per audio minute, although some pay more. However, one thing to keep in mind is that CastingWords has in the past offered bonuses for good quality work, and lots of times these bonuses do put you over the $1 per audio minute. They also have some transcription editing jobs you can work on in addition to transcribing. If you're working through the CastingWords site, payments are made to Paypal on Fridays. You have to have at least $1 to request a transfer. You do not need prior transcription experience to start and you don't have to take a test to get going, either. You can just dive in and start working. Transcription is almost always very flexible work from home. When you claim a file, it will have a deadline attached to it, but apart from that you can work whenever you want provided there is work available to do. Transcription isn't as easy as it might seem if you've never done it before. With most transcription jobs, there is a style guide you need to familiarize yourself with to ensure you're doing everything correctly. Be sure to read through CastingWord's style guide before you start and keep it open as you work so you can refer to it when you need to — and you might need to refer to it often in the beginning. Also, don't give up immediately. Transcription can be frustrating, but you can get good at it if you just keep going with it. You can go here to sign up directly at the CastingWords site. Good luck! Hello. Just an FYI for anyone interested in CastingWords. Check if your state is listed in their info before getting excited. I was thrilled thinking I had finally found the perfect company, spent an hour perusing their style and requirements only to find RI is not available for work 🙁 So disappointed! I’m so sorry to hear that. I’ll update the post to say that no RI residents are able to get work. Hi Anna, Just applied with Casting Words. I like it. I trained medical transcription a few years back. I know this is a little bit different, but I will do other types of transcription if a company will pay me. Just applied and apparently you have to take a test now. Love your blog! Casting Words wants me to send them a W-9 form and I’m a little worried about sending something with my SS# on it to a company I found on the Internet. Has anyone had any problems with this? When I started to freelance, I applied for a EIN (Employer Identification Number). Then, I used it instead of my SSN on freelance jobs. There are a few articles that explain the process for freelancers. Just Google it. Hope that helps. Do not waste your time trying castingwords. I got 5, 6 and 7 grades and after ten audio files, no more files available . It is a waste of time. I just looked at the jobs available and the highest they are paying is .17 cents a minute! That is really low for transcription. I can’t believe people are even doing that work for such little pay. That is $10.20 an hour…There are many transcription jobs that don’t even come close to that. 17 cents per audio minute, not minute of work. If you are exceedingly fast and can transcribe one audio minute in two real-time minutes, that’s $5.10 per hour. If it takes you longer, it’s even less. Do you know of any companies that pay at least $1 per audio minute? Ana, Can I earn $100 a week doing this full-time? You can certainly make that much doing transcription, but I’m not sure if it’s possible with this company or not. Thanks for answering :), I like your blog, I will try CW for 2 weeks to see how it works, if I don’t like it maybe I will find something in your blog, thanks a lot Anna you have a very very useful web here, btw I tried to follow you on fb but I couldn’t open the page, is your fanpage working? I’m a pretty poor transcriptionist so far, but I have nothing but good things to say about CastingWords. So far I’ve earned about 60¢ per audio minute, but because I’m new I don’t have access to the higher rate jobs. From everything I’ve read, 60¢/min for a beginner with no experience isn’t terrible, and there are plenty of places where you could make far less. No issues with getting paid at PayPal, and the one time I emailed with a question they replied very quickly.